There are about a dozen stars named after people and Barnard’s Star stands out among them. It was discovered a century ago by Edward E. Barnard, an avid observed, who found this dim star to be moving faster than any other in the night sky. It was soon realised that the star is very nearby, at a distance of 6 light years, and constitutes the second stellar system closest to the Sun. But Barnard’s Star has also become (in)famous for being among the first stars that were claimed to host orbiting planets. Astronomer Peter van de Kamp used astrometric measurements in the 1960s to announce the discovery of a planetary system of two giant planets with orbital periods of 20 and 12 yr. Subsequent analyses showed the astrometric wobble to be a spurious effect caused by various instrument issues and thus the existence of the two planets was put into question and eventually disproved. Further attempts to find planets around Barnard’s Star using various techniques over the next decades always returned null results. Barnard’s Star is an excellent target for precise radial velocity work. It is a red dwarf with a mass of about 0.16 solar masses and a temperature of 3270 K. But while red dwarfs are often magnetically active and therefore produce “noisy” radial velocities, Barnard’s Star is extremely quiet, probably due to its very slow rotation rate. After the initial planet discoveries around Sun-like stars in the mid 1990s, radial velocity surveys started to turn their interest to cooler stars, including red dwarfs. Barnard’s Star was an obvious target to try and look for planets and in 1997 observations were started with the HIRES instrument at Keck. 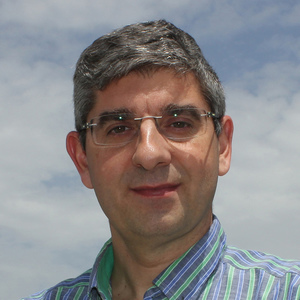 Lacking strong evidence for planetary signals, additional programs and facilities also acquired precise radial velocities, including the UVES instrument at ESO/VLT, the Carnegie Planet Finder Spectrograph at Magellan II in Las Campanas, the Automated Planet Finder at Lick, and the HARPS instrument at the ESO 3.6-m telescope in La Silla. In 2015, our team noticed that a low-amplitude periodic modulation was beginning to stand out above the noise. The period, however, was close to one year meaning that attaining a proper sampling was challenging. In addition, systematic errors related to the visibility of the star along the year might be causing a spurious signal. We decided to intensify the observations and many more measurements were obtained with ESO HARPS, with HARPS-N at the TNG in La Palma, and with CARMENES at the 3.5-m telescope in Calar Alto, bringing the total number of precise radial velocities to 771. Gathering such large number of measurements was only possible by combining our data with those from programs that observed Barnard’s Star over the years and whose public archival data we have used in our study. We thank them for their effort. With all the measurements at hand, we searched for periodic signals and two clear periodogram peaks quickly arose from the data, at periods of 365 days and 233 days. As mentioned before, the former period was extremely suspicious because it coincided with Earth’s year. Could we be facing another case of vanishing planet in Barnard’s Star? To avoid repeating history, we undertook a very intensive investigation of our data with the goal of “killing” the two planetary signals. If any of the signals survived our deep scrutiny perhaps they could be regarded as bona-fide planets that could withstand the test of time. We started with the 365-day signal, which soon succumbed. Tests showed it to be the result of tiny detector defects in the HARPS data that had already been identified by the group that built HARPS in Geneva. By removing the problematic parts of the spectrum, the signal at 1 year disappeared from the HARPS observations. But the 233-day signal stayed there, strong and highly significant, even when accounting for correlated noise in the data. Furthermore, we found the signal at 233 days to be significant also in the other datasets with more measurements and/or longest time span, namely HIRES and CARMENES, and it became stronger when analysing all the datasets combined. It is worth mentioning that similar but unrelated small systematic effects were found to contaminate measurements of most of the instruments, so we invested quite some time in understanding - and correcting for - them by inspecting thousands of observations of other stars with similar time-span and number of data points. The new corrections will probably help revealing new planet candidates on other stars, so this was worth the effort. After all this work, it became clear, beyond reasonable doubt, that this 233-day periodic wobble was there, and not caused by instrument effects. However, there was one more reason for concern, this being the possibility of the signal arising from intrinsic stellar variations. To investigate how stellar activity could conspire to produce a persistent 233-day modulation in the data with a semi-amplitude of 1.2 m/s, we tried to characterise Barnard’s Star magnetic variability. Over the course of many years our team had been acquiring thousands of photometric measurements. These were combined with activity indicators that we measured from the spectra, namely Hα and Ca II H&K chromospheric fluxes. In spite of the low activity level, a detailed analysis showed some modulations and we could constrain the spin period of the star to a value within 130 and 150 days (to be compared with the Sun’s period of about 25 days). Fortunately, this is relatively far from 233 days and thus there seems to be no direct association between the radial velocity period and the stellar rotation period. However, active regions have finite lifetimes and can evolve on the surface of the star. We had to study whether a combination of spot sizes, locations and evolutions could, by chance, result in a signal at 233 days. We ran extensive simulations in a Gaussian Processes framework in which we modelled starspot parameters from activity indicators and we simulated their effect in the time-series radial velocities. This allowed us to estimate that the chances of the 233-day signal being produced by activity are only 0.8%, and probably lower because our signal has some additional properties that distinguish it from those produced by activity (for example, a monotonous growth in significance over a timespan of 20 years). After all the tests, the signal survived both in its significance and nature and we therefore concluded that the most likely explanation is the result of Keplerian reflex motion caused by a planet. Well, we are, at least, 99.2% sure… and this is one of the reasons why we call it a “candidate” planet. Another reason is that, in general, planets detected with one method usually remain candidates until further independent confirmation comes from another method, and to account for the fact that in a small number of cases we could have a small star in a very low inclination orbit that could mimic the signal of the planet. The later scenario is extremely unlikely in this case because we would see such star given how close is Barnard’s Star to us. 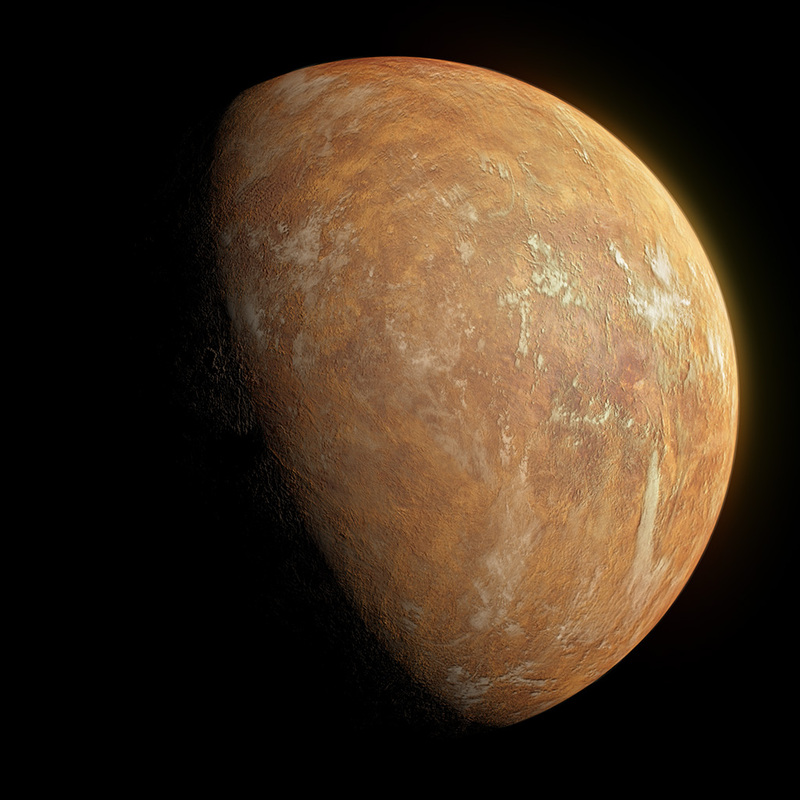 Artist's impression of Barnard's Star b assuming a rocky composition. Credit: IEEC/Science-Wave - Guillem Ramisa. This planet is, for now, our second-closest neighbour. Barnard’s Star b is a couple of light years farther than the famous Proxima b. 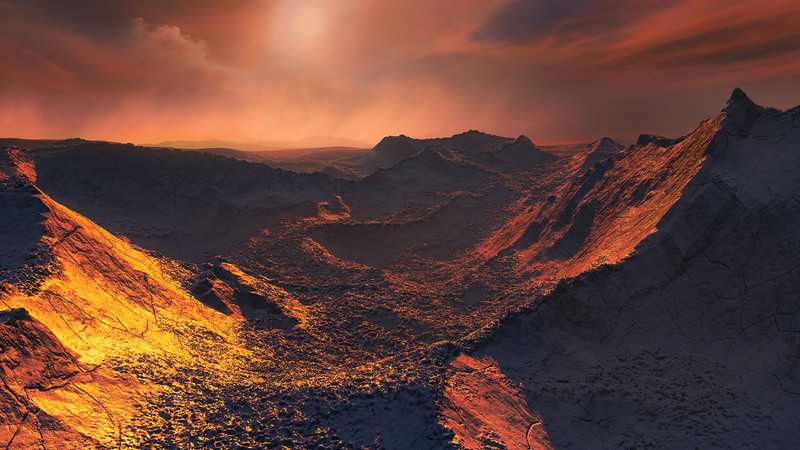 But while Proxima b is a temperate world that might have liquid water on its surface, Barnard’s b is more likely a frozen world, with a temperature of -170 C. Could it be rocky? Or a puffier mini-Neptune? Wildly speculating, it could even be a massive version of the Saturnian moon Titan, with a heavy atmosphere rich in volatiles, lakes, and hydrocarbon rain... We just don’t know, but in any case it should be a very different world from our own Earth. Its minimum mass is 3.2 Earth masses and we have no constraints on its orbital inclination to calculate its true mass. Future observations (radial velocities, astrometry) should help nailing the case for the planet and potentially allow for direct characterisation using imaging. In spite of being one of the best super-Earth type planets for direct detection because of its proximity, we may need to wait for at least a decade to see its picture taken. But in addition to the 233-signal, there was something else in the data that we wanted to study. Since we have eight different datasets, we had to come up with a way to combine them appropriately. Several tests allowed us to find the most consistent method and, to our surprise, the long, 20-year dataset clearly showed a 3-m/s modulation. Although a period that is comparable to the dataset length cannot be confidently determined, our best-fitting model suggested 18 years… Coming back to the introduction this is not far from the van de Kamp planets proposed 50 years ago. Could they be revived? Probably not. The radial velocity modulation amplitude we are finding is way smaller than what is expected from a planet of 0.5 Jupiter masses, as claimed by van de Kamp. In a Keplerian interpretation of our data, the minimum planetary mass is 10 times smaller and similar to Neptune’s. So, only by assuming a nearly face-on orbital orientation (inclination between 0 and 5 degrees) could the van de Kamp planets match the radial velocity wobble that we see. This is statistically very unlikely (less than 0.4% chance), although not impossible. However, we also see long-term (10-15 year) modulations in the stellar activity indicators, which lead us to think that this additional wobble may be related to a magnetic cycle of Barnard’s Star. In any case, the final word will come from continued radial velocity monitoring over the next years, or perhaps from the Gaia astrometric mission, which should reveal a planet in a wide orbit in case it exists. We will be anxiously awaiting the next Gaia data release to find out.